We are very proud to announce the acquisition of 2 additional response vehicles to bolster our fleet. These will increase the visibility of CBAR’s vehicles and reduce our response times even further, which are according to industry standards, already exceptionally fast. Please keep an eye out for our shiny new CBAR vehicles in your area. 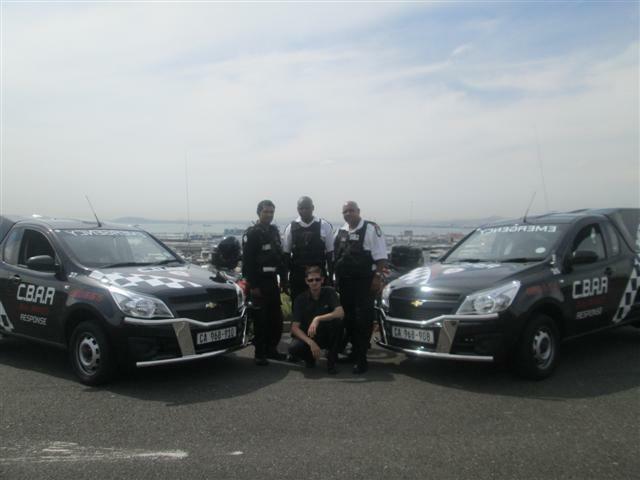 We can now confidently boast that CBAR has the highest number of armed response vehicles within the City Bowl area. The first incident occurred on Friday the 22nd March at 4.20am when intruders broke into a house in Highlands Estate where the client and her 6 year old daughter were alone and asleep. They awoke to the terrifying sound of smashing glass and pressed the panic button. 2 vehicles were immediately dispatched and the first vehicle on the scene was R26, driven by our response officer Christian Constance, who arrived within 4 minutes. He in conjunction with his backup officer immediately commenced a full search of the property and found that the intruders had fled the scene. In a letter of gratitude from the client the following was stated “Boy were my daughter and I relieved to see him. But not only did he perform his duty by rushing to the scene and investigating the grounds for intruders (who were of course long gone), but he did more than that, he was, in fact, everything that the SAPS were not. He was reassuring, genuinely caring, proactive, protective, professional, and very sweet to my 6 year-old daughter; all in all a lovely, kind, brave person who made us feel a lot better after a horrible incident. I would like to commend him, and the service offered by CitiBowl on the night of our break-in”. The second incident occurred on 26th March at 12.26pm in Leeuwenvoet Road Tamboerskloof, when a distress call was received from one of our clients. Again 2 vehicles were dispatched R26 and R24, which arrived 2 minutes after the call was received. The response officers already had a description of the suspect and searched the area and apprehended the suspect on the corner of Milner and New Church Street. SAPS were notified and the suspect was taken by them to the client who made a positive identification. The suspect was found in possession of the 2 stolen items and he was confirmed to be from Woodlands, Mitchells Plain. CBAR would like to take this opportunity to wish all our clients a safe and happy Easter and a slightly belated Chag Sameach to all our Jewish clients. Please remember to arm your alarm systems should you be leaving your homes unattended, as we are reliant on your electronic security to affect a response. Please be reassured that at all times CBAR is only minutes away.